Hidden in the woods, protected by NATO soldiers and worthwhile to visit: the Serbian Orthodox monastery in the Kosovar town Deçan: Visoki Dečani. The Visoki Dečani is how you would imagine a monastery in a fairy tale. Surrounded by woods, beautifully shaped and completely wrapped in silence. Visitors are very welcome and with a bit of luck you will be guided around inside by a monk. The monastery might be the most beautiful and positive sight that proves that Serbia once ruled the territory of Kosovo. More than twenty Serbian monks live and work in and around the church. Every detail of this religious site seems perfect. Visoki Dečani is therefore a good place to bring Albanian Kosovars, who only know the dark side of Serbia. The church looks already nice from the outside, but the inside is overwhelming. There are two large areas which are open for public. The walls are painted till the ceiling and walls are decorated with gold. 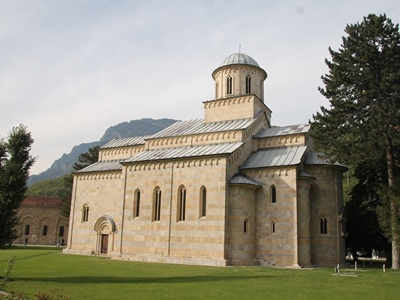 The Serbian Orthodox monastery in Deçan is built in the 14th century, in the time of king Stefan Uroš III of Serbia. Since 2004, the church is a site on the list of UNESCO world heritage. Next to the religious site you will find agricultural land. The monks use this land to harvest. Visitors can buy their local goods in a special store. If you are interested in buying Orthodox icons, do not forget to visit this tourist shop. 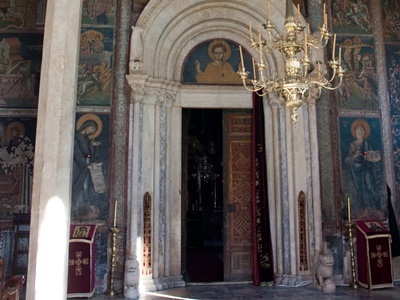 Because of the ongoing possibility of nationalistic violence (throwing a stone, graffiti) against Visoki Dečani, the NATO guards the Serbian Orthodox monastery. For that reason, you have to bring an ID card. There is a possibility that the soldiers will keep your identity card and give a visitors pass in return. Do not worry: they always give your belongings back. Do you want to understand why many Serbians consider that ‘Kosovo is Serbia‘? May I know if the monastery is open on 1may 2016 and 2may 2016? Dear Janice. Although we are not sure, we expect that the Monastery is open those days. Be aware of the fact that the 1st of May is an official holiday in Kosovo. Hello, I’d like to visit the nonastery on 20 April 2019 and also to know the opening time please. Dear Nahomi, we are sorry, but we do not know this detailed information. In general, they are open every day during office hours, but we cannot assure that. Hopefully you can find another source.